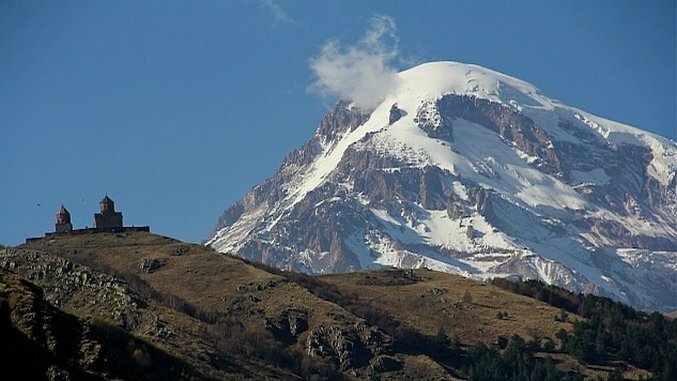 Tucked between Russia and Turkey (as well as Armenia and Azerbaijan), the Republic of Georgia is finally emerging out of the shadows of its more famous neighbors to be considered an up-and-coming travel destination. Though still largely undiscovered by international travelers—or at least those from North America—the country is shaking off the cultural stagnation of its Soviet past and is in the midst of a rapidly developing art, design and fashion scene that, together with its natural beauty, distinct cuisine and rich history, will only make you wonder why travelers have stayed away for so long. From ancient churches scenically perched on a backdrop of snow-capped mountains, to the seaside resorts of the Black Sea and the vineyards of Kakheti, Georgia has a spectacularly diverse landscape. And, given the country’s density—it’s less than half the size of the U.S. state of the same name—everything is within a few hours of the capital. You can get between cities by riding a marshrutka (public minivan) and, for more remote and mountainous areas, find a tour company from the dozens that operate out of the tourist hub of Old Tbilisi. One of the best journeys to take is along the Georgian Military Highway, which runs from the capital of Tbilisi through the steep Caucasus Mountains and over the border to Vladikavkaz, Russia. This will take you to the ancient capital of Mtskheta—the medieval fortress of Ananuri—and within reach of possibly the country’s most iconic image, the 14th-century Gergeti Trinity Church perched alone under Mount Kazbek. To get to the church (at an elevation of 7,100 feet), it’s a two-hour hike (or half-hour jeep ride) from the town of Stepantsminda. With last year’s opening of Rooms Hotel, housed in a Soviet-era publishing house, Tbilisi now has a contemporary design hotel to show off the remarkable creative talent in the city. Traditional handicrafts, such as hand woven rugs, and vintage pieces sit alongside original artworks by renowned Georgian artist Eteri Chkadua and custom-made pieces by local designers. For a closer look at the city’s active art scene, visit ArtArea, a contemporary art space in an old Soviet factory, and take a look at Project ArtBeat, which supports local Georgian contemporary art by promoting it internationally and taking it to remote areas. If the Grand Budapest Hotel-style uniforms worn at Rooms pique your interest, visit nearby cafe/boutique O Moda Moda whose owner designed them. The fashion scene here has been steadily warming since Tbilisi Fashion Week (TFW) launched in 2009 and is officially on fire now that Georgian-born designer Demna Gvasalia was recently named Balenciaga’s creative director. Other local designers to shop include Diana Kvariani, Lako Bukia and Dalood, who, at the most recent TFW, showed a jacket featuring script from Georgia’s most famous epic poem and accessories designed to look like letters from the unique Georgian alphabet. If you are visiting Georgia, come hungry. This little country has a singular cuisine that far outweighs its size. Loosen your belt in preparation for cheese, butter and egg-filled khachapuri flatbread (a kind of Georgian pizza); badrijani nigvzit (fried eggplant rolls filled with walnut garlic); and khinkali (meat and broth filled dumplings that arrive at the table by the dozen). Tip: eat khinkali like a Georgian by grabbing the dumpling by its “handle” and tipping it upside down before biting in and drinking the broth. If you are lucky enough to have made Georgian friends and can score an invitation to a supra, clear your entire day—and maybe the following one, too. The supra, a traditional feast, is a deeply embedded part of Georgian culture where tables heave under the weight of piles and piles of delicious home-cooked dishes, which continue to arrive over the many hours’ long smorgasbord. The proceedings are presided by a “tamada,” a master of ceremonies who leads each toast of homemade wine, draining his glass (or sometimes a ceremonial ram’s horn) each time. Bonus points to guests that can keep pace. Turkish Airlines is currently offering round-trip flights from New York City to Tbilisi for under $700. Even better, the airline allows you to extend your layover in Istanbul, which means you can essentially make two trips for the price of one. Even if you don’t have the time to extend, if your layover is at east six hours long, you can take advantage of the airline’s free Touristanbul service, which picks passengers up at the airport and takes them around the city’s most famous sites. It’s certainly a whistle-stop tour but, still, it breaks up the journey more satisfyingly than hanging around at the airport. Karen is a Scottish freelance writer now based in New York City.